A police officer walks through a gate at the Tompa border station transit zone in April 2017. Hungary has two "transit zones" with shipping containers that are used to automatically detain migrants while their asylum claims are investigated. This month, Hungary began denying food to asylum-seekers whose claims were rejected and appealed, human rights groups say. Authorities have not only refused to provide food to those asylum-seekers, but also denied them permission to buy their own food and blocked attempts by outside groups to donate food, according to the Hungarian Helsinki Committee, a human rights watchdog group based in Hungary that has provided legal assistance to the asylum-seekers. András Léderer, information and advocacy officer for the HHC's refugee program, tells NPR that the policy appears to be designed to "force people to abandon their asylum applications." The European Court of Human Rights has stepped in repeatedly to order Hungary to provide food to the asylum seekers — one case at a time. "Basically, you have to go to court in order to get a slice of bread," Lydia Gall, a Budapest-based researcher for Human Rights Watch, tells NPR. "It's completely absurd and inhuman." "This latest antic of depriving people of food is just the latest in a row of various measures that the government has taken to [persuade] people to leave," she says. Hungary's immigration service did not respond to an email from NPR requesting comment. The office told Hungarian media earlier this week that it is not explicitly obligated to feed asylum seekers whose claims are rejected, Human Rights Watch says. Since 2015, migrants have been attempting to cross into Hungary, which is a member of the European Union, from neighboring Serbia. Hungary considers Serbia a "safe third country" where refugees should remain; the United Nations disagrees. Hungary lets very few of those would-be refugees even apply for asylum. Once they apply, their chances of being approved are understood to be low. The government is not releasing current statistics, Léderer says, but a few years ago, Syrian asylum seekers had a 10 percent chance of being recognized as a refugee. All migrants seeking asylum are confined to "transit zones," or camps along the border, while their cases are pending. That process that can continue indefinitely. The European Commission has found that the practice is "incompatible with EU law." One of the laws prohibited nonprofit organizations from providing aid to undocumented immigrants. 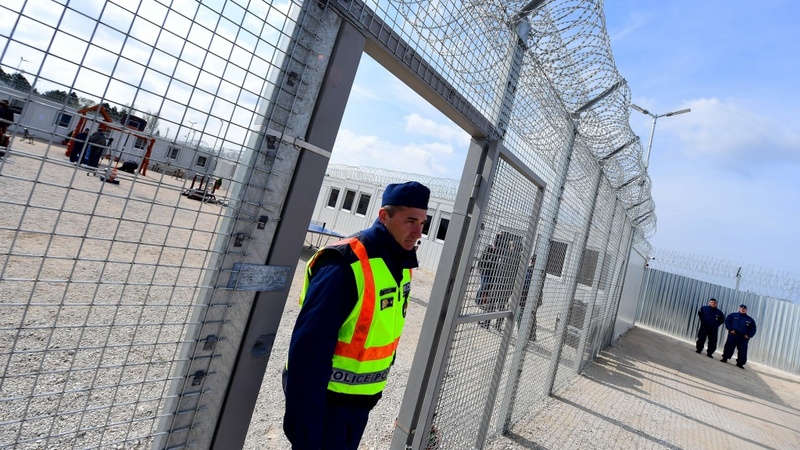 Another measure altered various elements of Hungary's immigration and asylum laws. One of those changes led to the denial of food to asylum-seekers. The rule change — which went into effect in early July — specifies that when an asylum claim is rejected, a would-be refugee in a transit zone is subject to "alien policing procedures," even if they've appealed their cases. And under "alien policing procedures," the government maintains, it has no obligation to feed adults. Since then, eight asylum-seekers have been rejected and appealed their cases, Léderer says. While they waited for the results of their appeal, Hungarian authorities stopped providing them with food. The European Court of Human Rights confirms that it has stepped in with "interim measures" in four cases this month. Another case is currently pending before the court, the Hungarian Helsinki Committee says. Until the court steps in, that asylum-seeker in question — a young woman from Afghanistan — is not being fed, the organization says. Children and breastfeeding mothers have been provided food, the HHC says, but they were prohibited from sharing it with family members. "Imagine a place literally in the middle of nowhere, located next to the border fence at the Serbian-Hungarian border," Léderer says. "These zones are made up of metal shipping containers ... where all the asylum seekers are detained until there is a final decision on their asylum application. "The transit zone is encircled with high fences and barbed wires, and within the transit zone there are also smaller sectors divided by further fences and barbed wires," he says. "People are confined to these small sectors." Some of the asylum-seekers who have been denied food have had cash on them and have asked permission to buy food, "but there is no option for them," Léderer says. According to Hungarian media outlets, a pastor named Gábor Iványi, who runs a prominent charity, collected food for refugees and attempted to deliver it to the transit zone. He was turned away by authorities, Léderer confirmed. Iványi has been a vocal critic of the Hungarian government. Gall and Léderer both say the policy seems designed to pressure asylum-seekers to turn away of their own accord. "A person who's been deprived of food for two or three days [will] start looking around for options to get that food," says Gall, the Human Rights Watch researcher. "And the only way that they can do that at the moment is to abandon their claims and walk out the door back into Serbia. But then, legally speaking, they will abandon their asylum claim." If they want to file another claim, she says, they have to get at the back of the line to enter one of Hungary's transit zones — and the wait is more than 18 months.